This Friday is the starter night of Fellowship groups at Trinity and we would love you to come along, find out more and get involved. 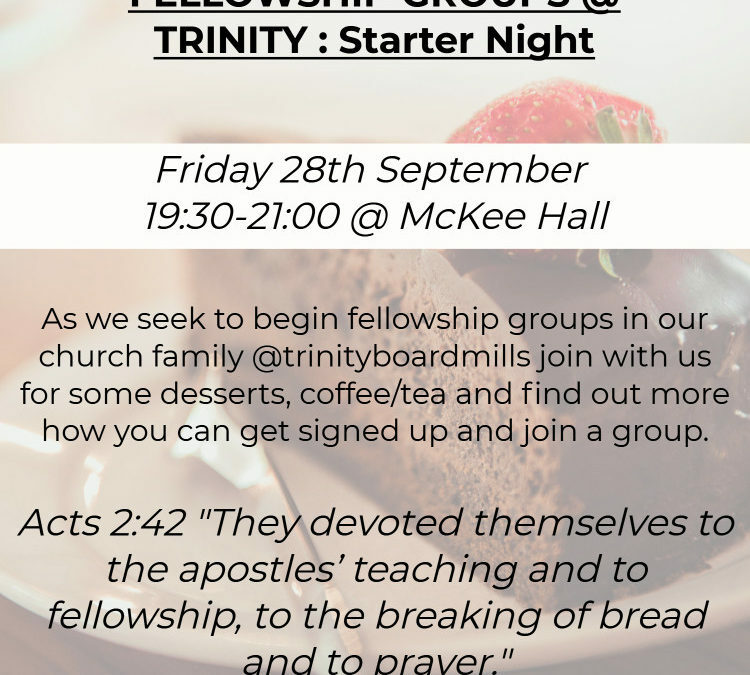 This Starter Night is an opportunity to gather together for some fellowship around a cuppa and dessert, get to know one another and find out more about fellowship groups which begin w/c 15th October in 3 locations (Lisburn, Boardmills, Ballynahinch) on 3 evenings (Wednesday, Thursday, Friday) every 3 weeks. WHAT IS A FELLOWSHIP GROUP? Fellowship groups will meet on a regular basis in a hosts home, a facilitator will lead a Bible Study and there will be time set aside for fellowship and prayer. Ideally there will be a mix of ages, genders and maturity of faith within each group. This should provide a healthy level of discussion, different viewpoints and a sense of community in which we learn together. On an agreed periodic basis, the fellowship groups would come together and meet for a meal together. This would provide an opportunity for evangelism and to extend an invite to others who might be interested in joining a Bible study. Come and join us for our starter night this Friday 28th September, share in food and fellowship, find out more and sign up to the group on the night and location that suits you. The study booklets will be available on the night so you can prepare and participate fully as each group gets started. We would love you to join us, why not get involved as we seek to grow deeper in fellowship with one another and go deeper as disciples serving Christ.